I love the word texture. It's one of those rare words that sounds like what it means. To me, texture has meant cables, purl bumps and raised twisted stitches. Those elements give hand knitters an infinite combination of stitches to create beautifully textured knitted fabric. But what if all the texture is in the yarn? Before I started spinning, I would barely glance at thick 'n thin yarns or (gasp!) novelty yarns. But now that I've started spinning and have finally been able to achieve a consistency with my yarns, I find myself very curious about all those other techniques. Now, my hands dip into those baskets with Knit Collage yarn, wondering how on earth it's created. Why does this yarn look so different from all the others? How did they get that silk flower in there? Lo and behold, Purl Soho was offering an Advanced Spinning class. My questions were about to be answered! I signed up, and last Tuesday night I felt like a beginner all over again. My very patient teacher kept throwing out advice, tips and hints about each technique (bless her heart). I was slowly starting to catch on when class ended. So I rushed home to keep practicing. My frustration and denial was at an all-time high when I finally admitted to myself that I needed a bulky flyer. I ran back down to Purl Soho and picked one up. Then, bee-lined it home and attached that big bad boy to my Ladybug. My OCD kicked into high-gear, and I've been practicing all the different techniques I learned in class around the clock. Obviously, a lot more time needs to be invested. On the left is my attempt at Corespinning - the main reason I took the class. I love the little cocoon slubs you get with this technique. I assumed it was just clumps of roving in certain spots. Boy, was I wrong. As "luck" would have it, I had the toughest time with this technique. The purple monster in the middle is my idea of the technique called Candy Stripeing. It's almost like plying, so not so bad. Last, but not least, Thick n' Thin. 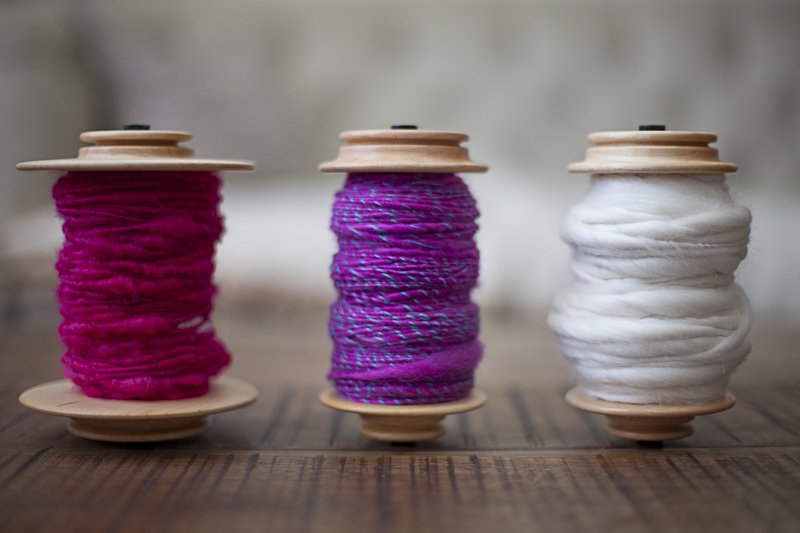 You spend all this time when you first learn to spin to achieve consistency with your yarn. All those clumps were ripped out, and pounds of roving wasted. Now, it's wanted. Of course, it's not a matter of undoing what you've learned. There is a certain technique to this as well. I was not amused, but I think I finally got the gist of it. And, by the way, it's a total fiber hog. You can fill up a bobbin in 3 minutes flat. Class No. 2 is Tuesday night. We'll be plying. I'm not sure what more could be done to this fiber, so stay tuned.